INNOCENT by-standers including children were injured in the violence triggered by the 12-week strike by the Association of Mineworkers and Construction Union (AMCU) at Sibanye-Stillwater’s gold operations, its CEO said on Monday. “The fact is it’s not a popular strike,” Neal Froneman told Miningmx on the sidelines of the Investing in African Mining Indaba in Cape Town. 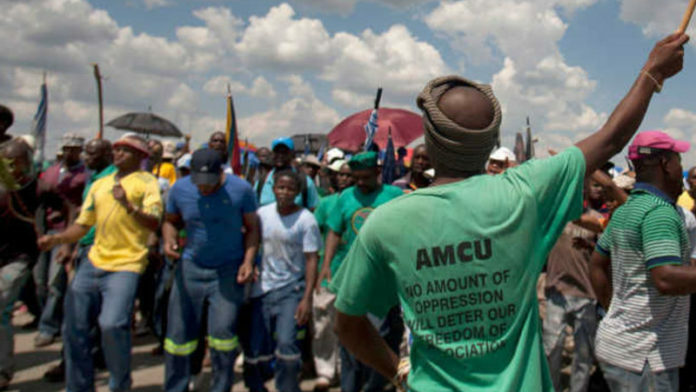 Two incidents in January which have not previously been reported underline the chilling backdrop to the strike, which follows the usual AMCU pattern of intimidation and violence. In one incident the family of a member of AMCU rival the National Union of Mineworkers (NUM) had their house fire-bombed, with the mother and three children severely burned. “We have been supporting the family, but it is terrible. The children had 60% burns,” said Sibanye spokesman, James Wellsted. In the other instead, an AMCU member who was mistaken for a NUM member was set alight and burnt to death. Both incidents took place in the Free State. NUM spokesman Livhuwani Mammburu confirmed the incidents while AMCU officials could not immediately be reached for comment. AMCU did not agree to the wage settlement Sibanye reached with NUM and two other unions, and Froneman said he would not “entertain” a separate agreement for AMCU. Sibanye is still producing gold at its strike-hit operations, but for security reasons, does not want to disclose the percentage of its workforce that has been reporting to work at its various shafts. There has been disruptions with no night shifts taking place because of security concerns but the strike is not hitting Sibanye’s bottom line. “The strike would have to run a few years to affect the viability of our business,” Froneman said. On another front, Froneman said Sibanye has made huge inroads in its war against illegal mining on its operations and has been able to scale back the amount of money it has devoted to the issue. Last year, Froneman told Reuters that the company had cleared virtually all illegal miners from its shafts after a blitz that saw 1,383 arrests made in 2017 in connection with illicit mining. In 2018, that number fell to 137, the lowest number of arrests made for illegal mining in one year since the Gold Fields’ spin-off was formed in 2013. “I suspect that we still have a few illegal miners, but it’s very few. We have focused our controls and our expenditure on our long-life shafts and we have very few disruptions now or incidents related to illegal mining. So I would argue that commercially it’s been a smart thing to do, to dig in our heels and get these guys out,” Froneman said. If there was a way to get an accurate vote on which workers would like to strike and which would like to work, you would find the vast majority would prefer to work! When will they learn that the unions are as capitalist as the company and are only interested in building memberships to line their own pockets. The fact is that Sibanye does have money for the increase that AMCU demands. But Sibanye wants to keep this money for a hanfull of shareholders instead of giving it to 15 000 workers. And to assist the workers, the unions think it’s a good idea to kill each other (and families)? Another scenario: Is this not playing into the hands of Sibanye? The gold division is in trouble. Its deep, old and the grade is not what it was. What if Sibanye is contemplating splitting the gold and platinum divisions into separate entities and then keep the listing on Platinum assets and Stillwater only. It will then give them the opportunity to sell off or close the gold operations. The Unions must be careful. Its clear that Sibanye see their future elsewhere and not really in SA. Strike moved to platinum belt in 7 days all AMCU members going on strike so joe says!